At 39 weeks, your baby is still changing and growing, despite being capable of surviving in the outside world. You may be noticing changes in your body as well, as you prepare for labor and delivery. On average, babies are about 20 inches long from head to toe and 7.25 pounds at 39 weeks. However, your baby may be smaller or larger. According to the Mayo Clinic, your baby is doing more than just getting bigger this week; he is also subtly changing shape. Your baby's chest and torso are becoming more prominent. If your baby is a boy, his testes are continuing their descent into the scrotum. The testes began descending when you were about four months pregnant, and they are nearing the end of their journey. At this point in your pregnancy, the American Pregnancy Association reports that your cervix may be preparing for labor through a process known as effacement. After your baby engages into the pelvis, your cervix will become shorter, softer, and thinner. During your weekly prenatal visit, your healthcare provider will check for signs of effacement and dilation. However, effacement and dilation isn't an automatic indicator of labor. In some women, the process can occur over a period of several days or weeks. It's perfectly normal to be feeling impatient at this point in your pregnancy. Many women are experiencing uncomfortable third trimester pregnancy symptoms like bloating, back pain, constipation, swollen feet, hemorrhoids, and round ligament pain, and sleeping may be a challenge as well. What's more, you may be very anxious to hold your baby after so many months of waiting. However, if you can, week 39 is a good time to relax and enjoy these last few days or weeks without the responsibility of an infant. Have coffee or lunch with friends. Go to a movie or see a show with your significant other. Work on a craft project or gift for someone special. Buy a new outfit to wear after the baby comes. Go to a yoga class or other relaxing fitness class. Pop a movie in the DVD player, and make some popcorn. Play cards or a board game with friends or family. Work on a photograph album or scrapbook. No matter what you choose to do with your time, be sure to listen to your body. You may need to rest frequently, especially if you've been dealing with insomnia. Even through you technically have only one more week of pregnancy left, your baby's due date is only an estimate. 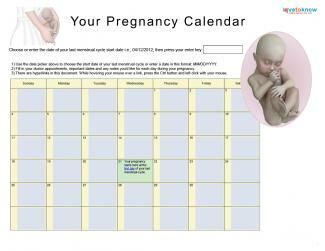 In fact, your baby won't be considered "post-due" until you've reached the beginning of week 42. Try to relax and enjoy this time if you can; your little one will be here soon enough.